Coffee Crisis will see a release on Switch, Mega Cat Studios has confirmed. The game is a “neo-rogue brawler that puts you in the shoes of the only baristas on Earth with enough heavy metal in their veins to fend off an alien assault.” You can play alone or with a friend while fighting in eight different locations. 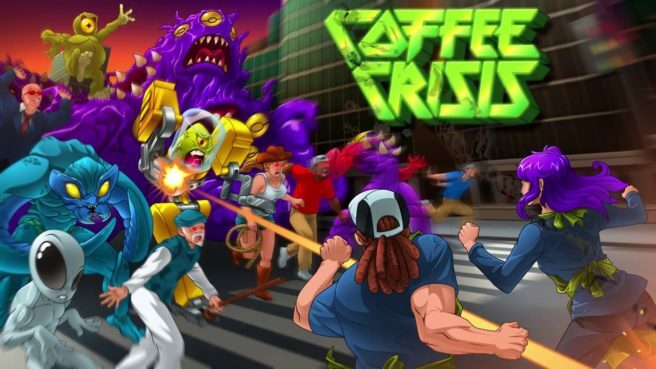 Coffee Crisis is an neo-rogue brawler that puts you in the shoes of the only baristas on Earth with enough heavy metal in their veins to fend off an alien assault. Play solo or join up with a friend to fight across eight unique locations ranging from your Coffee House HQ to the far reaches of outer space. Go up against an army of wild alien enemies, and the humans they have brainwashed with a variety of weapons, special moves, suplexes, and coffee! The Smurglian race has come to Earth and they’re not leaving until they steal our three most prized commodities: heavy metal, free Wifi, and our coffee. Crunch through fistfuls of alien meat as you stop their invasion, and enjoy random modifiers to the enemies and action on each playthrough. It’s a totally unique cup of beat ’em up action every time you play! – Already averted the crisis? Come back for more in Death Metal Mode, where the difficulty is cranked to 11! – Encounter random modifiers that could make you an invincible killing machine or summon a swarm of raging possessed cowgirls! You’ll never experience the same cup of cosmic coffee carnage twice! – Twitch/Mixer integration lets you enjoy the game while keeping both hands on your coffee cup! A release window for Coffee Crisis on Switch has not yet been determined.